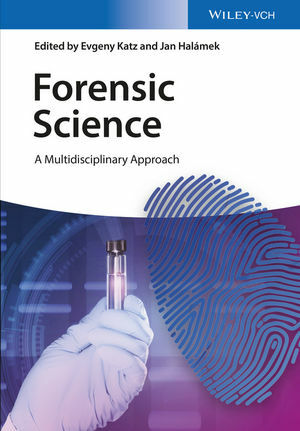 Concentrating on the natural science aspects of forensics, top international authors from renowned universities, institutes, and laboratories impart the latest information from the field. In doing so they provide the background needed to understand the state of the art in forensic science with a focus on biological, chemical, biochemical, and physical methods. The broad subject coverage includes spectroscopic analysis techniques in various wavelength regimes, gas chromatography, mass spectrometry, electrochemical detection approaches, and imaging techniques, as well as advanced biochemical, DNA-based identification methods. The result is a unique collection of hard-to-get data that is otherwise only found scattered throughout the literature. Evgeny Katz is Milton Kerker Chaired Professor at the Department of Chemistry and Biomolecular Science, Clarkson University, NY, USA. He obtained his PhD in Chemistry from the Frumkin Institute of Electrochemistry, Moscow, in 1983 and then was a senior researcher at the Institute of Photosynthesis, Pushchino, Russian Academy of Sciences, for eight years. He was a Humboldt fellow at the Technische Universität München, Germany, from 1992 to 1993, and a research associate professor at the Hebrew University of Jerusalem from 1993 to 2006. Evgeny Katz has (co)authored more than 400 papers in the areas of biocomputing, bioelectronics, biosensors and biofuel cells. Thomson Reuters included him in the list of the world's top 100 chemists over the past 10 years as ranked by the impact of their published research. Jan Halámek is Assistant Professor in the Department of Chemistry at the University at Albany, State University of New York, USA. He received his PhD in Biochemistry from the Masaryk University, Brno, Czech Republic. From 2003 to 2005 he worked as a postdoctoral fellow, earning the Marie Curie Individual Fellowship, at the University of Potsdam, Germany. Before joining the University at Albany, he was postdoctoral researcher in the Department of Biophysical Engineering at Twente University, The Netherlands, and research associate in the Department of Chemistry and Biomolecular Science, Clarkson University, NY, USA. Jan Halámek has contributed more than 70 scientific publications and book chapters and holds three patents.